Hammer's long-running series of Frankenstein films starring Peter Cushing -- beginning with THE CURSE OF FRANKENSTEIN (1957) and concluding with FRANKENSTEIN AND THE MONSTER FROM HELL (1973) -- represent something of a unique achievement in horror cinema, or was for many years: a sequence of films in which a single anti-heroic protagonist is allowed to develop greater complexity over a number of adventures. You could point to similar cases that followed, like Paul Naschy's Waldemar Daninsky, but Naschy's werewolf was regenerated anew for each new story, given new origins and circumstances that held closer to the surface rather than deepening with each appearance. There is a case to be made that Hammer's Frankenstein series may have been, more accurately, a series of series: THE REVENGE OF FRANKENSTEIN forming a diptych with its direct predecessor CURSE OF FRANKENSTEIN, 1964's Universal-produced EVIL OF FRANKENSTEIN (1964) standing curiously alone, and the final bunch -- FRANKENSTEIN CREATED WOMAN (1967), FRANKENSTEIN MUST BE DESTROYED (1969) and MONSTER FROM HELL -- composing a sort of trilogy of the Baron's aspiration, bitterness and wreckage. However you choose to take them, whole or piecemeal, their collective beauty resides in the continuity of Peter Cushing's central performances. When he returns to his looted chateau in EVIL OF FRANKENSTEIN and finally utters the bereft words "Why can't they leave me alone?" we feel his disappointment extending all the way back to 1957, and it somehow miraculously forgives more misdeeds than we can easily recount. And why? Because we too, in our hearts, share his belief that life is too precious for death to be anything but an utter abomination. Its actual placement may be open to debate, but I've never known anyone to dispute that REVENGE either tops, or is very close to the top of the list of Hammer's best work in this series, or indeed on a list of Hammer's work in the horror genre. On a Frankenstein list, its main competition comes from MUST BE DESTROYED, which is generally regarded as director Terence Fisher's masterpiece (it is that, but, just as importantly, it was a major return to form) and often discussed as Fisher's bleakest film. Watching REVENGE again for the first time in several years, this acclamation rose to mind because it is, at the very least, as bleak and despairing about human nature, and the way people are encouraged to become dishonest and duplicitous by social divisions and career politics. 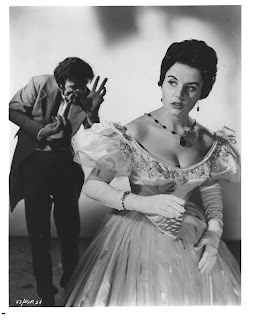 Both Francis Matthews as Frankenstein's protégé Hans Kleve (a surname that would return in CREATED WOMAN) and future alpha Bond Girl Eunice Gayson (pictured) as Margaret Conrad do great damage in their innocence while Frankenstein himself, in the guise of Dr. Victor Stein -- a well-to-do surgeon who divides his time between tending to the privileged in a private practice and the poor in a Dickensian free clinic -- is, at the very least, giving back to his community more than he takes (which may be the odd pickpocket's arm), and it eventually murderously turns on him for doing so. Michael Gwynn is outstanding as a successful brain transplant patient who, once beaten by a groundskeeper, turns cannibal (his pathetic crashing of a high society soirée is one of the great dramatic moments in British horror); Gwynn's performance feels related to Richard Wordsworth's brilliant work in THE QUATERMASS XPERIMENT, but Wordsworth is here too, stealing every scene he's in as a crafty clinic attendant who helps himself freely to Margaret's free tobacco and abhors the notion of a bath because his filth keeps him warm. The gripping story, again by Jimmy Sangster with additional dialogue by George Baxt (CIRCUS OF HORRORS), builds to what may be the most astonishing and ironic finale of any Frankenstein movie: the Baron's dream is finally realized... not by him, but by his pupil. Viewed on Turner Classic Movies HD. On second viewing, I found more things to enjoy about the film and discovered that the snowboarding sequence wasn't badly done in and of itself; it was just one of the series' rare indefensible ideas. Rick Yuen and Toby Stephens make a pair of reasonable villains, the Icelandic ice hotel is a worthy setting for a tense if fantastical finale, and the fencing battle sequence between Brosnan and Stephens is one of the standout set pieces of Brosnan's tenure. During the scene supposedly set in Cuba, I noticed in the background the impressive fortress location used for the prison in Jess Franco's seminal Women In Prison film 99 WOMEN (1969) -- the Fortress of Candelaria in Cadiz, Spain. Viewed as part of the BOND 50 Blu-ray set. This Dennis Wheatley adaptation from Hammer Films, placed in the trusty hands of novelist Richard Matheson, comes tantalizingly close to being one of Terence Fisher's most memorable pictures but I'm not sure it quite makes it. There is something off-kilter about it, almost experimentally so, as there is with much of Fisher's 1960s work; it begins with an unexpected sudden rush of forward movement, almost before we get our bearings in the story, and it ends with a folding back of time itself, which helps to undo some of the things done. 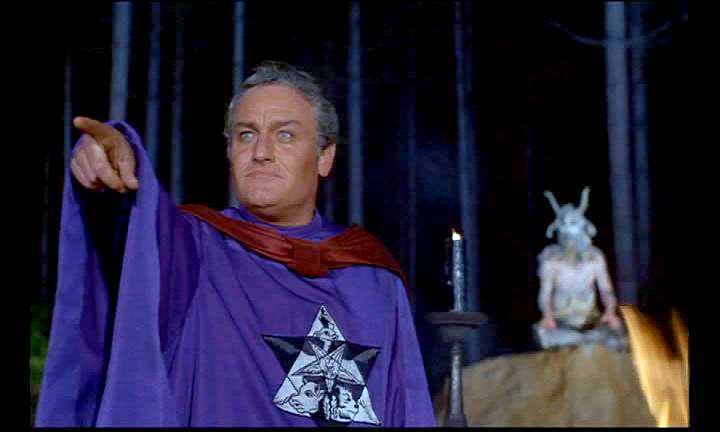 Christopher Lee excels in his finest heroic role as Nicholas, the Duc de Richlieu, and he's well balanced in this contest between Good and Evil by a somewhat overripe, satyr-faced Charles Gray (pictured) as Mocata, the leader of a coven determined to sacrifice the girl Tanith (Niké Arrighi), whom the Duc and his friends have rescued. Patrick Mower, cast as Simon, the younger male heroic lead, would later play a virtual reprise of his role here -- a young man of means who is seduced by social acquaintances into black magic and devil worship -- opposite Peter Cushing in Robert Hartford-Davis' INCENSE FOR THE DAMNED (aka BLOOD SUCKERS), made a couple of years later. There is a great deal to commend the film, but it appears it barely had sufficient budget to realize its story. It leaves much of its necessary opulence and spectacle to the imagination. Sometimes these deficiencies are cleverly masked -- note how when Simon asks the Duc if he might borrow a car, Lee wearily tells him, "Take any one of them." (With a line like that, we don't need to see them.) Yet the whole finale rests on the film's ability to impress us with the frightening imagery impinging on our heroes outside the sanctity of a chalk circle and, on this level, it fails pitifully to deliver. (A recent UK Blu-ray release has actually taken steps to digitally modify these scenes, without including the original untouched film in the set, angering the movie's fanbase.) French actress Arrighi -- an unusual, memorable presence who subsequently played ever diminishing roles in WOMEN IN LOVE, SUNDAY BLOODY SUNDAY, DAY FOR NIGHT (and COUNTESS DRACULA) -- appears to have been dubbed throughout by actress Fenella Fielding. Composer James Bernard lends an ethereal quality to her appearance with a theme that sounds suspiciously like a finger circling the rim of a wine glass. It almost feels there should be a temporary embargo placed on viewings of Terence Fisher's DRACULA (US: HORROR OF DRACULA), because we're patiently awaiting the release of a promised restored version that will add back footage censored from nearly all prints since the time of its first release; however, when it was shown by Turner Classic Movies over the Halloween season in HD, I couldn't resist revisiting it for the umpteenth time. Some will tell you it's the greatest horror film ever made; I disagree, though not with vehemence. It's not the Stoker novel -- it leaves out huge chunks of the story, consolidates characters, and so on -- yet it comes closer than any other film to satisfying the viewer in the way Stoker's novel satisfies its readers. Seldom has such a philandering adaptation (thank you, Jimmy Sangster) kept such faith with its source. 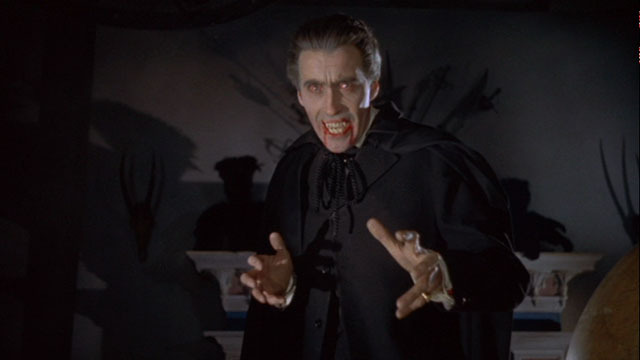 There has never been a more formidable Dracula than Christopher Lee, who summons a vividly unholy energy as he roars through the library scene (pictured), and he is perfectly balanced by the firm Christian authority of Peter Cushing's Dr. Van Helsing, who complements Lee with a series of equal shows of panache, cutting into frame with a brandished crucifix and running the length of a banquet table to vanquish evil with the full brunt of sunlight. The secondary roles are likewise perfect and perfectly poised -- Michael Gough (uncommonly restrained) and Melissa Stribling as the devoted Holmwoods, Carol Marsh (so memorable in BRIGHTON ROCK) as Lucy both sweet and feral (how she makes us feel her hatred of the protective wolfbane strewn about her room, and her surrender to the Count's nocturnal visits to her neck), and even little Janina Faye as the innocence sought by her undead "aunt." Photographed by Jack Asher, this is one of the most unconsciously artful-looking of horror films; it is lovely but with a loveliness that only supports the enchanting quality of its storytelling, never becoming too noticeable for the film's overall good. I am so looking forward to the restored version.